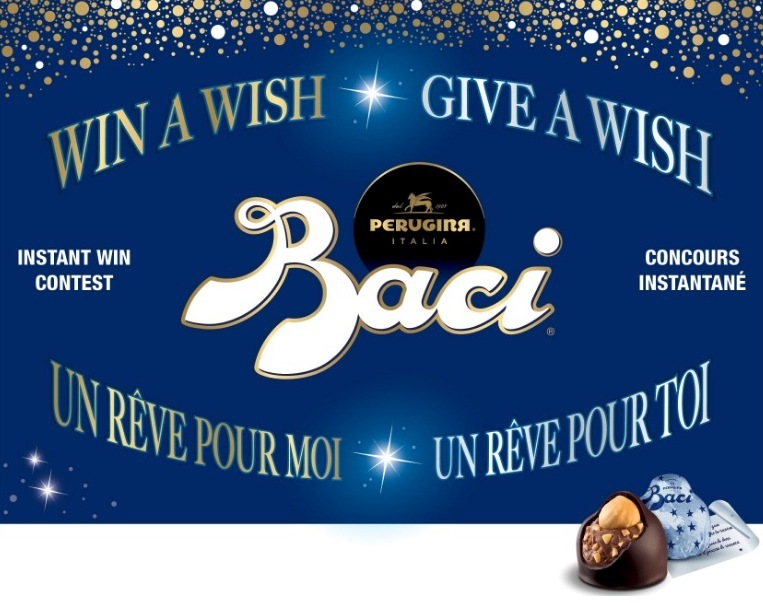 Enter the Baci Perugina “Win a Wish Give a Wish” contest for your chance to win one of three 10,000$ CAD cash prize among 50 secondary prizes. The contest is only open to all legal residents of Canada, who have reached the age of majority. To enter this contest you need to buy a specially labeled Baci 171g Dark or Baci Perugina 171g Milk Chocolate and find the official PIN, then visit the official contest website at BaciWinaWishGiveaWish.ca and provide all the required information including the Pin number, email, your full name and address and submit your entry. Contest ends on June 4 2019 at 11:59 pm EST. Winners will be instantly rewarded at random and will have to answer a skill testing question. There is a total of three Grand Prizes available to be won. Each Grand Prize consist of a $10,000 cash prize. There is also a total of fifty secondary prizes each consisting of a $1,000 cash prize. The Win a Wish, Give a Wish contest commences on November 1 2018 and ends on June 4 2019 at 11:59 pm EST. Winners will be instantly notified if they are a winner of any prize with the instructions to claim the prize. Thank you BACI for being the best chocolate/nuts sweets. Baci has been my favourite for as long as I remember. I have given gifts of only of this delicious chocolate to everyone, to all my friends, relatives AND aquaintances. Everyone has been greatful – and has become addicted to them as I have! I have created a whole new generation of Baci followers.